The National Aquarium in Baltimore, Maryland sits on a typical post-industrial urban waterfront. Their unique position as global actors and habitat experts makes them well positioned to be an agent of change for urban water quality. 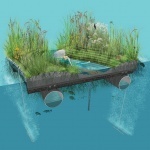 With an ultimate goal of transforming their campus into a living lab, the Aquarium teamed with designers, engineers, and researchers to investigate new technologies to produce a more sustainable and high-performing floating wetland. ▲内港发展时间轴：马里兰州巴尔的摩内港是最早转型为文化设施的后工业滨水区之一。然而，港口的再开发并没有解决自然系统退化和水质差的问题。Inner Harbor Timeline. The Inner Harbor in Baltimore, Maryland was one of the first post-industrial waterfronts to be turned into a cultural amenity. However, the redevelopment of the harbor did nothing to address the harbor’s degraded natural systems or its poor water quality. ▲生物多样性目标：随着栖息地的流失和污染物流入港口，物种多样性变得越来越少。是否可以通过改善水质来促进本地物种的回流，并增加生物多样性？Biodiversity Goals. Species diversity has diminished over time with habitat loss and polluted runoff entering the harbor. Could improved water quality and artificial habitats foster a return of native species and increase biodiversity? ▲水质现状分析：溶解氧含量是衡量水质的重要指标。在较温暖的月份，港口过多的养分（来自雨水径流）会激化藻类种群的大量繁衍。由此而产生的水华将吞噬水体中可用的氧气，导致鱼类的死亡。Existing water quality analysis. Dissolved oxygen levels in the harbor are an important indicator of water quality. In warmer months, the harbor’s excessive nutrients (from stormwater runoff) can fuel an explosion of algae populations. The resulting algal bloom removes available oxygen from the water column, which in turn causes a fish-kill. ▲传统漂浮湿地的生命周期：漂浮湿地的引入开始让巴尔的摩港的环境恢复到城市化之前的状态。不过，传统漂浮湿地的寿命很短，在经济上不可持续。若要将其生命周期延长至15年乃至30年，需要利用哪些综合性的技术呢？The lifecycle of a traditional floating wetland. 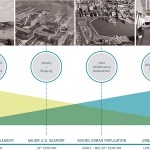 The introduction of floating wetlands to the harbor has begun to reestablish conditions that existed before Baltimore’s urbanization. However, the short life-cycle of conventional floating wetland is not economically sustainable. What integrated technologies are necessary to extend their lifecycle to 15 years? To 30 years? ▲园区的长期规划：国家水族馆的长期目标是吸引游客、激发保护行动、恢复生态系统以及促进社区参与。园区规划的核心内容是构建一个面积为半英亩的漂浮盐沼。Long-term campus vision. The long-term goals of the National Aquarium are to welcome and engage visitors, inspire conservation action, restore ecosystems, and foster community engagement. 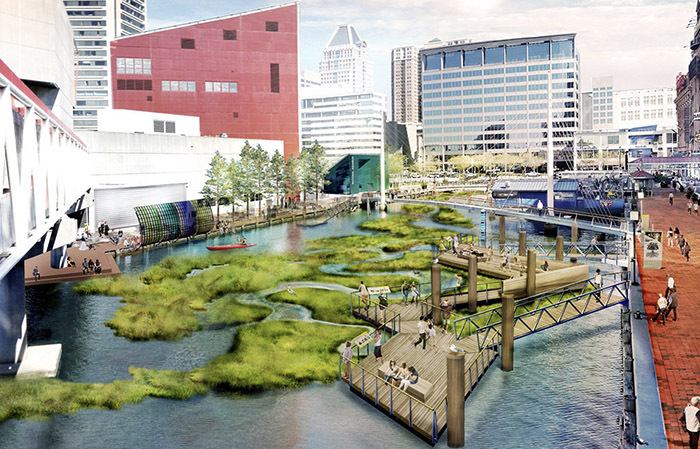 The centerpiece of its reimagined campus will be a half-acre floating salt marsh. ▲漂浮盐沼的剖面图。研究团队与国家水族馆共同为漂浮盐沼制定了功能目标，从而设计出一个尺度较小的原型。该原型旨在对各项技术进行测试和校准，以最大程度地加强生态影响。Section of floating salt-marsh. 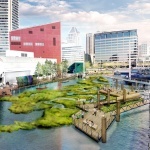 The research team worked with the National Aquarium to define performance goals for the floating wetland, which informed the design of a smaller prototype. The prototype was designed to test and calibrate technologies in order to maximize ecological impact. ▲设计原型与计划建造的漂浮盐沼的比例对比。原型的尺寸是实际湿地面积的1/25。场地中既有的码头桩基和人行天桥被结合到设计当中，使公众能够获得高处的视野。探测站被安装于原型之前，以便收集基线数据并测量原型对于水质的影响。The scale of the prototype relative to the planned floating salt-marsh. The prototype is 1/25 the size of the future wetland. Its location utilizes remnant dock piles and an existing pedestrian bridge to provide elevated public viewing. A Sonde station nearby was installed a year before the prototype was installed in order to collect baseline data and measure the impact of the prototype on water quality. ▲漂浮湿地原型的植被种植方法：湿地上计划种植切萨皮克湾区的原生物种，并基于淹没水位对其进行分层。四个植被区域为植物各类物种提供了多样化的栖息地。Floating wetland prototype planting approach. 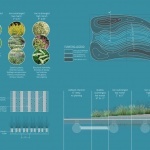 The planting plan uses native Chesapeake Bay species and stratifies them by inundation level within the prototype. Four vegetation zones provide a diversity of habitats for both the plants and the organisms that call them home. ▲漂浮湿地原型的曝气设施：气提泵和安装在湿地边缘的曝气扩散器共同构成了灵敏的基础设施，可以阻止溶解氧含量的降低，从而避免鱼类的死亡。水的混合能够促进生物膜的形成，并在低溶解氧的环境下为物种提供必要的生存条件。Floating wetland prototype aeration infrastructure. A combination of airlifts and perimeter aeration diffusers create responsive infrastructure that can counteract low dissolved oxygen events in the harbor before a fish kill. The mixing of water invites colonization of new biofilms and creates a refuge for species in the event of a low dissolved oxygen event. ▲可调节浮力的弹性结构：该结构通过可调节的静态浮力来抵消生物积累带来的重量。这也为湿地的维护和研究提供了便利。在湿地受到入侵物种破坏的情况下，PET介质层可以进行模块化的替换。Floating wetland prototype adjustable buoyancy and resilient structure. 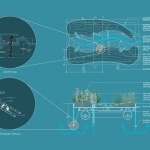 The structure utilizes reserve, adjustable, and static buoyancy to counteract the accumulation of biomass. This also improves accessibility for maintenance and allows unique opportunities for research. The structure allows modular replacement of the PET growing medium if the wetlands are damaged or compromised by invasive species. ▲原型的概念化渲染图。该原型被用于测试新型技术的性能、可持续性和回弹性。每平方英寸的湿地都将为各类生物提供生长、繁衍、换毛、产卵和捕食的条件。Conceptual rendering of the prototype. The prototype is being used to test the performance, sustainability, and resiliency of new technologies. Every square inch of this ecological powerhouse provides opportunities for a diverse range of organisms to grow, colonize, molt, spawn, or eat. ▲原型中已经观察到的物种: 研究团队对分布在漂浮湿地的所有物种进行了编录，包括一些原本被认为已经从内港消失的物种。活跃而多样化的生物膜有着十分重要的作用，因为它们处于食物链底端，能够为各类物种提供栖息条件。Observed species on the prototype. The research team has inventoried species colonizing all the nooks of the floating wetland including species that were believed to have altogether disappeared from the Inner Harbor. Thriving, diverse biofilms are important because they sit at the bottom of the foodchain and allow for larger species to inhabit the wetland. ▲原型中已经观察到的生物膜：在原型安装后不久之后，国家水族馆的科学家便发现了大量被漂浮湿地吸引而来的生物膜。它们的出现为更大范围种群的生长和构建更加完整的本地物种网络提供了基础。Observed biofilms on the prototype. 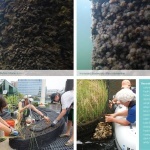 Shortly after the prototype was installed, scientists at the National Aquarium found a diversity of biofilms that had been attracted to the floating wetland. Their presence is the first step in broad reaching biodiversity of larger species and a more complete localized species web. ▲原型曝气系统的性能分析：该原型配备的曝气系统能够帮助缓解周围水域的低溶解氧事件，同时为狭生性物种提供理想的小环境。Observed performance of prototype aeration system. The prototype’s integrated aeration system has helped buffer the surrounding water against low dissolved oxygen events while also providing optimal microhabitats for specialist species to occupy. ▲原型的适应性：湿地原型通过浮筒骨架进行支撑。经过分层的PET介质能够为不同物种提供不同高度和深度的栖息地，并模拟切萨皮克湾潮汐沼泽群落的实际环境。Prototype adaptability. The prototype is supported by a framework of buoyed pontoons and its connective skeleton. 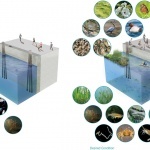 The PET medium is layered to provide habitat-specific elevations relative to the water surface and to mimic the relationships that exist in tidal marsh communities of the Chesapeake Bay. The National Aquarium’s mission is to inspire the conservation of the world’s aquatic treasures. 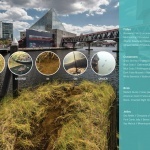 With its prime location on Baltimore’s Inner Harbor, the Aquarium seeks to localize this mission by implementing a new campus landscape focused on highlighting important habitats of the Chesapeake Bay, including the introduction of a uniquely resilient engineered floating tidal marsh ecosystem. This habitat will support native marsh grasses and important microhabitats vital to many of the Chesapeake Bay’s estuarine organisms. 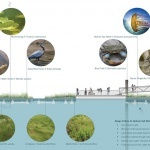 The tidal floating wetland is expected to improve water quality through the natural benefits of the wetlands combined with engineered solutions. 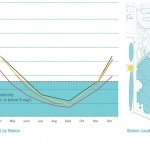 The first step to realizing this campus-wide initiative is confirming that the proposed design solutions will make a meaningful change to water conditions. 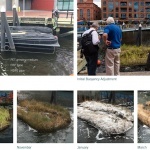 Using a smaller-scale prototype as its basis for this research, the National Aquarium team is researching interventions, including their dimensional, spatial, and anchoring details, as well as developing performance criteria to fully investigate methods of improving biodiversity, transforming water quality and demanding resiliency. 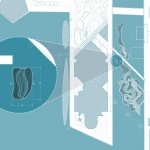 The knowledge gained by this research will ultimately inform future campus wide solutions. 1.Habitat Creation – The ability to adequately establish sustainable microhabitats present within a typical salt marsh and dramatically improve biodiversity within its urban context. 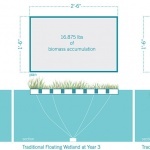 2.Wetland Resiliency – Elevate the life span from a conventional floating wetland systems to allow for adjustable buoyancy to mitigate added weight from biomass accumulation. 3.Water Quality – Integrate continuous aeration through a network of air diffusers to assist in regulating dissolved oxygen and water movement within the shallow canal and function as a refuge for aquatic organisms during low dissolved oxygen (D.O.) events. The wetlands consist of media set at different elevations, relative to the water surface to mimic the microhabitats observed in tidal marshes of the Chesapeake Bay estuary. The wetlands are designed to rest at a predetermined elevation in the water column to support a variety of habitat conditions, both above and below the water surface. A channel between wetland areas mimics a small tidal canal. The structured floating wetland media is custom fabricated with the layers +/- 3″ from waterline embedded with buoyancy foam integrated into the media. Media layers outside the stated threshold are continuous solid material. 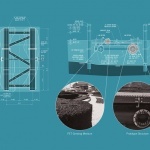 The overall service life of the structured floating wetlands is a function of the structural platform. Increased longevity from UV degradation will be achieved with the application of a cementitious bonding layer. 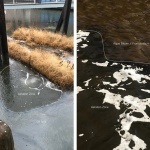 Layered unwoven polyethelene terepthalate (PET media) is utilized as wetland panels (5 by 12 foot maximum) are fabricated by layering 1.5-inch PET media to create topographic microhabitats. Modules have internal foam for reserve static buoyancy. 1. How might the buoyancy foam impact the growth/spreading of plantings? 2. What is the best surface coatings/cover material for durability and ability to retain sand layer in the shallow canal? 3. What range of water depths are intertidal species willing to utilize without tidal fluctuations? 4. At what elevations do the high marsh communities have the highest survival rates? 5. With oyster communities being a keystone species, do clusters of oysters in strategic places (canal openings) further entice species to the structure? The floating wetland tethering and anchorage system must be capable of resisting anticipated wind, wave, and current loads, while allowing the wetland to effortlessly respond with daily tidal fluctuation. The prototype requires designed floatation devices to maintain appropriate levels and stability when subject to environmental or personnel loads and are constrained to have very little reserve buoyancy (freeboard). The highest elevations of the marsh levels extend a mere 6 inches above water and the medium is porous and almost entirely void space. The lack of reserve buoyancy makes the wetland less stable than most conventional floating structures (e.g., floating docks, barges, etc.). This inherent lack of stability leads to a more sensitive floating structure that has separate reserve, static, and dynamic buoyancy systems. Pontoon Buoyancy Control System – Each pontoon is outfitted with a pneumatic air hose at the top and ballast water hose at the bottom. The hoses run to the perimeter of the wetland where an operator can open and close valves as necessary to push air into the pontoon or bleed air outwards, thereby controlling the water level in the pontoon and the floating elevation of the wetland. Reserve Buoyancy System in PET Media – The reserve buoyancy system within the PET layer is one of the most difficult and sensitive portions of the buoyancy design. As buoyancy is directly related to the weight of water displaced, the wetland has very little buoyancy in reserve to counteract the added weight of maintenance workers and waves. In response, at contour locations above the waterline, cavities within the PET are filled with spray-applied closed cell marine foam. Static Buoyancy System and Ballast Weights – A portion of the HDPE pontoons were originally planned to be filled with closed cell marine foam, and provide an unchanging buoyant force, referred to as the “static buoyancy system.” This foam fill and static buoyant force are calibrated to match the weight of the wetland’s structural components, PET, and plantings. As insurance that the prototype does not float too high up in the water, attachment points for ballast weights are provided on the HDPE pipes. The ballast weights are also required to simulate the effect of accumulated marine growth to test the pontoon buoyancy system. 1. What is the durability and longevity of pontoon ballast control system (i.e., pipes, valves, controls)? 2. How sensitive is the pontoon system and frequency needed to re-ballast pontoons? 3. What are the buoyant properties of plantings? Only foam within PET and PET with off-the-shelf properties are currently considered in reserve buoyancy calculations. Any additional volume displacement within PET layers will increase wetland stability. 4. What are the effect of marine growth colonization and decrease of volumetric void space in PET over time? The prototype aeration system allows for testing of different materials and aeration technologies to increase dissolved oxygen levels within the water body to ensure the survival of fish, oysters and other aquatic organisms during low-oxygen events such as algae blooms and turn-over periods. The system utilizes an onshore blower, air delivery piping (on shore and floating laterals), and fine-bubble membrane diffuser assemblies that are suspended from the floating wetland. The prototype aeration system is adjustable and operated on an as-needed basis. The system function is informed by dissolved oxygen (D.O.) measurements from probes (sondes) within the canal or by manual operation. The system utilizes an onshore blower, air delivery piping (on shore and floating laterals), and fine-bubble membrane diffuser assemblies that are suspended from the air piping system. A goal of the aeration system is to raise dissolved oxygen levels in the top 6-8 ft of water column in the areas around the floating wetland prototype. The system includes an onshore blower that is installed in a location with adequate soundproofing, maintenance access and that provides for efficient distribution of the air into the air delivery piping network. Service Life- Equipment, piping, accessories, appurtenances and diffusers are constructed of materials suitable for use in an estuarine/marine environment. Membranes use PTFE to resist fouling. The aeration system operates 24/7 to monitor treatment levels around the prototype. The system is manually controlled and may require manual adjustments as needed. 1. How will enhancing dissolved oxygen levels and water movement along the wetland perimeter affect aquatic life in the canal and within the wetland structure? 2. At what rate will the airlift assembly become clogged (biofoul)? 3. How many diffusers will it take to make a sizable impact in aquatic activity? 4. What is the optimal spacing of aerator? Determine by measure D.O. at various depths and distances.